Well, Six Flags Great Adventure located in Jackson, New Jersey has gone completely batty. It seems today all of the 2014 projects for all the Six Flags amusement parks have gone live and Great Adventure isn't to be left out. 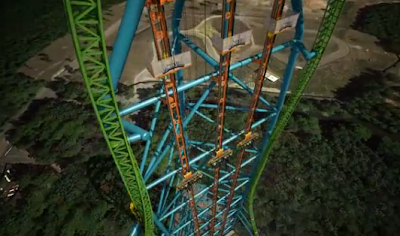 Coming in 2014, they are sticking not one but THREE drop tower cars to the Kingda Ka track. Sitting at 415 feet tall with a top speed of 90 miles per hour, 'Zumanjaro' will plummet riders straight down the structure of the Kingda Ka Coaster. At which point they claim "Kingda Ka will zoom around you as you drop". I assume that means they expect the giant lawn-ornament to run more in the 2014 season. Although I admit, I'm wondering a lot of this new and massive addition to the structure will also be subject to random closures during windy periods of time? This is often what close's down Kingda Ka. Sadly, this new drop ride is coming with a very steep price. 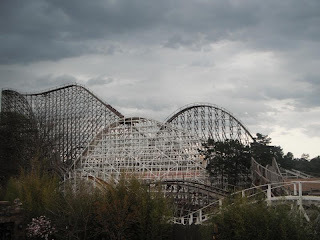 The classic wooden coaster "Rolling Thunder" (often called 'Rotting Lumber' as Six Flags has willfully neglected this ride for years now) will be removed to make room for this addition. Honestly, I'd rather they put the money into fixing Rolling Thunder then put a Drop Tower onto the lawn ornament. Rolling Thunder was and is a great ride, it has just always need a lot more love and affection then Six Flags has ever shown it. The last day of operations for the classic wooden coaster will be September 8th, not giving fans much time to say their goodbyes. So I suggest you head over there quickly and get your last rides in now.